This is not the first time in which Satechi has rolled out a device that is capable of charging up multiple devices via USB simultaneously, and chances are pretty good it will not be the last, either. 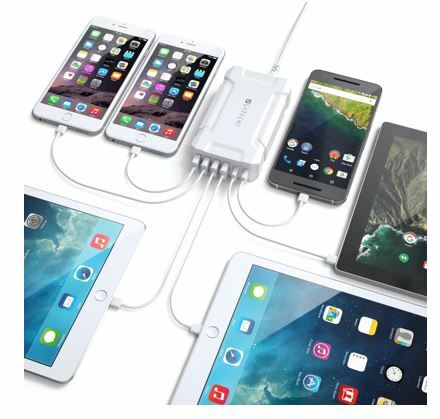 With the new Satechi Multi-Port USB Charging Station, it will come with a quartet of Type-A ports as well as a couple of Type-C ports, allowing Satechi’s latest device enables users to juice up multiple devices at the same time, and all of them in the same place, which means you do not need to fret about misplacing your devices when you are charging them. It does not matter where the Multi-Port USB Charging Station sees action – be it in a household filled with multiple devices, a crowded office, or a mobile workspace, the Multi-Port USB Charging Station will be able to offer users with a simple solution to ensure all devices are juiced with minimal effort and space. It will boast of 60W of power and integrated smart auto-detect technology, allowing the Multi-Port USB Charging Station to quickly and efficiently charge smartphones, tablets and other Type-C or Type-A USB-powered devices. It will also sport a compact design of 4.5” x 2.75” x 1.13”, allowing you to free up even more space in your home while you charge them devices. An on/off switch allows one to control power without needing to unplug any devices. You can pick up the Multi-Port USB Charging Station in either black or white for $29.99 each.